The Outlander writers answered questions about episode 311 on Tuesday. Toni Graphia, Shannon Goss, and Karen Campbell took control of the Twitter account and answered questions this week. Below are the answers provided to fans this time around. 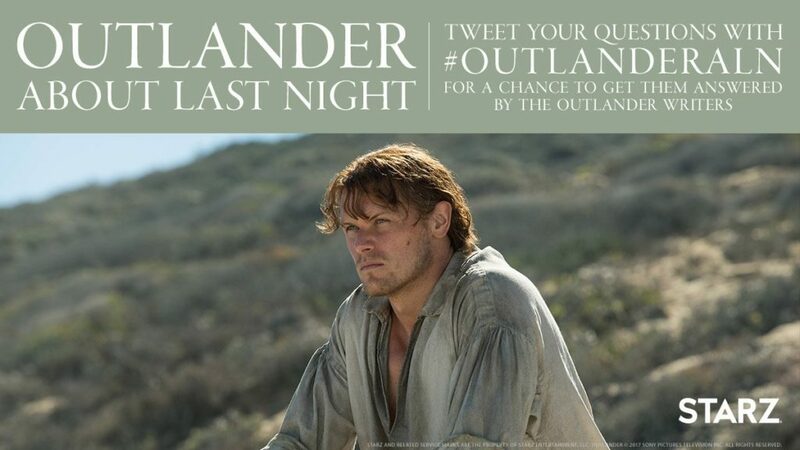 @OutlanderWriter #OutlanderALN writers talk about moving story forward & the need to compress details of the story because there is so much to cover. Why did you choose to show Claire wandering around the jungle for 15-16 minutes? I got the message in 5. #OutlanderALN Who wrote what scenes, Karen and @shanniebebe? May I guess Karen, first half, Shannon, second half of #Uncharted? @OutlanderWriter #OutlanderALN #Uncharted How did Jamie end up on that beach…what happened to the Artemis? #OutlanderALN Toni your writing style always produced some if my most memorable episodes. Have you put away your writers quill? This entry was posted in Karen Campbell, Shannon Goss, Toni Graphia and tagged Karen Campbell, Season Three, Shannon Goss, Toni Graphia, Twitter Q & A, Uncharted by Sarah Ksiazek. Bookmark the permalink.